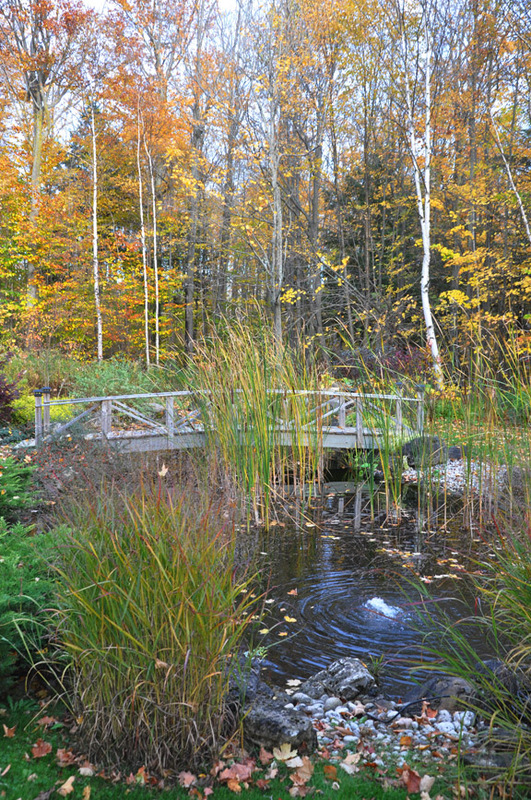 A pond is always a standout garden feature, but in the fall, the dark, reflective surface of the water becomes a splendid mirror for seasonal color, transforming a pond into something quite magical. 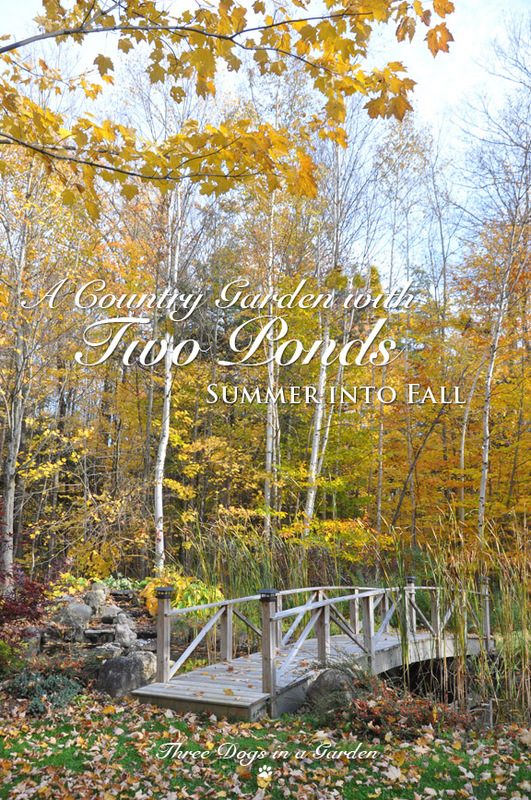 Frank and Sue Gooderson have not one, but two ponds in their country garden in Caledon, Ontario. 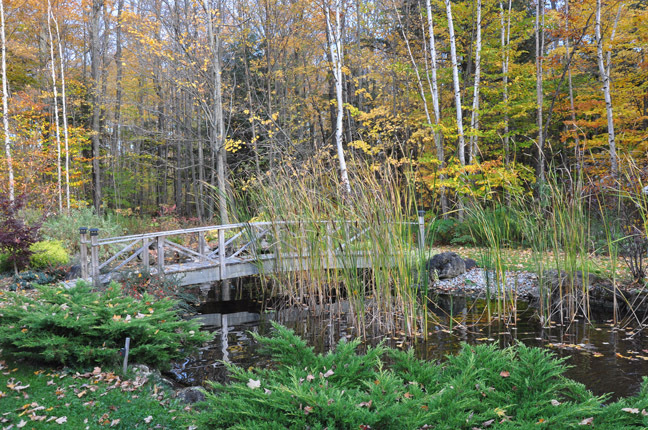 The first and larger of the two ponds comes into view the moment you turn into the driveway. 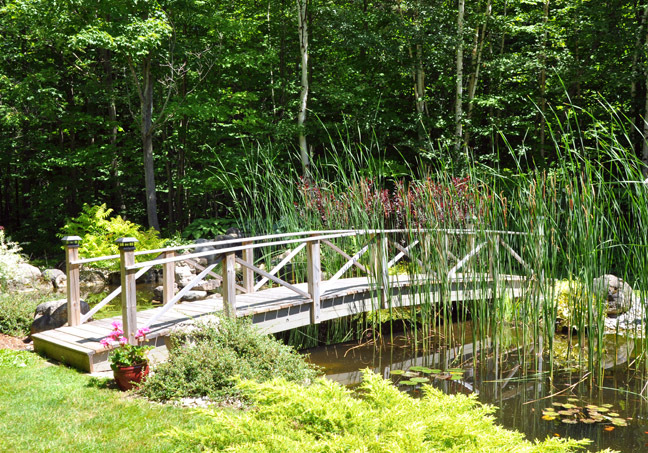 A curved wooden bridge divides the large oval pond into two smaller pools of water. A waterfall feeds the smaller of the two pools. I first visited Frank and Sue's garden back in August on the sunniest of summer days (unfortunately not the best circumstances for good landscape photography). 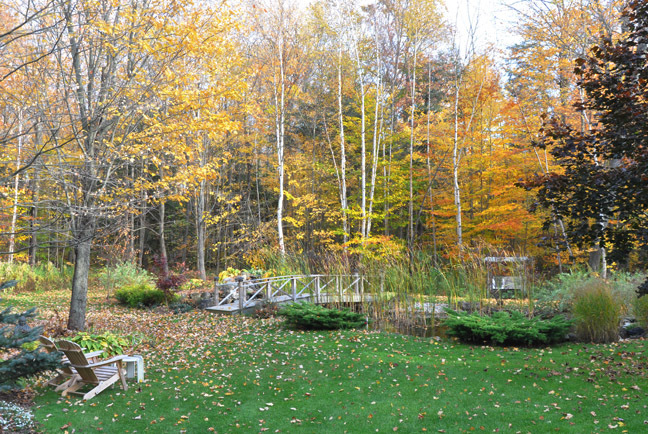 I always like to show a garden at its best, so I determined to return again in October when the light is more golden and the leaves have begun to show their brilliant fall colors. 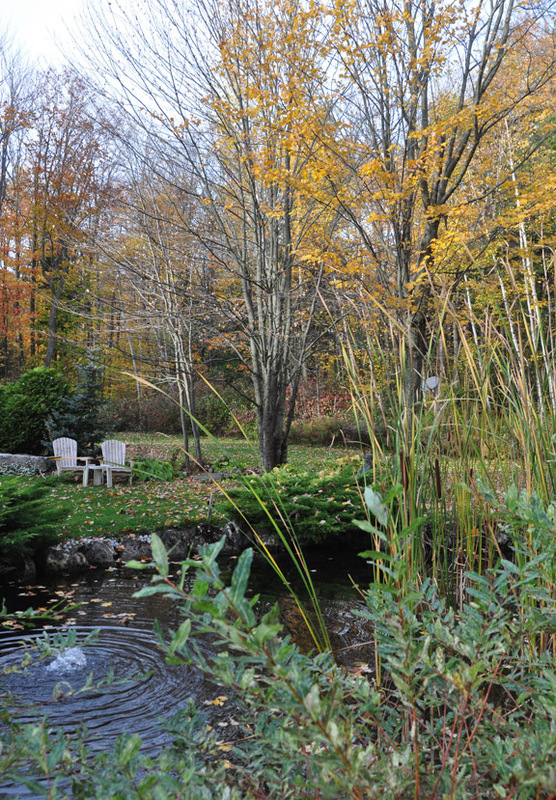 The Gooderson's had a water feature in their previous home in Oakville, so when they moved to the countryside in retirement, another pond was definitely on their wish list. The wide lot of their new country home dipped a little on one side and the ground there was quite marshy. This seemed like the perfect place to create a large, natural pond. They dug out the area and hoped for the best. Unfortunately, the only thing that happened was the weeds moved in. When rainwater failed to pool, a liner was added to hold water. 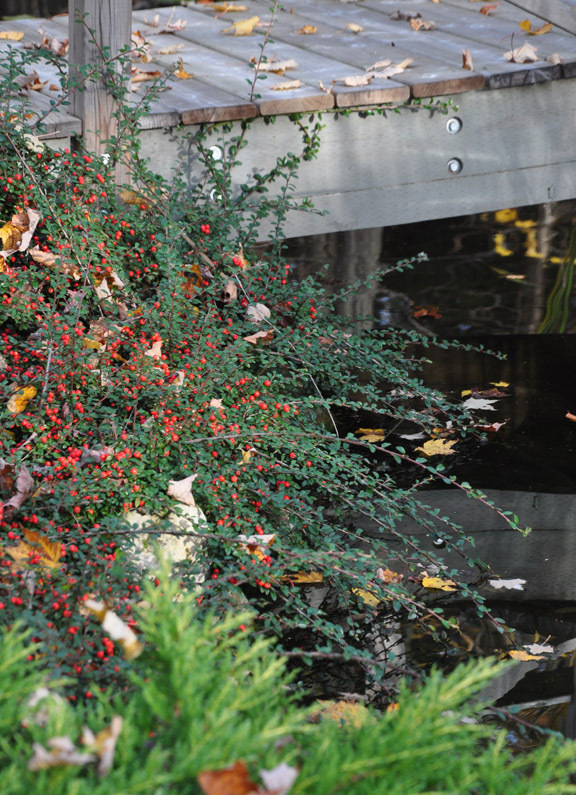 The arching branches of a Cotoneaster dangle into the water. One of the really nice things about this shrub are the red berries in the fall and early winter. 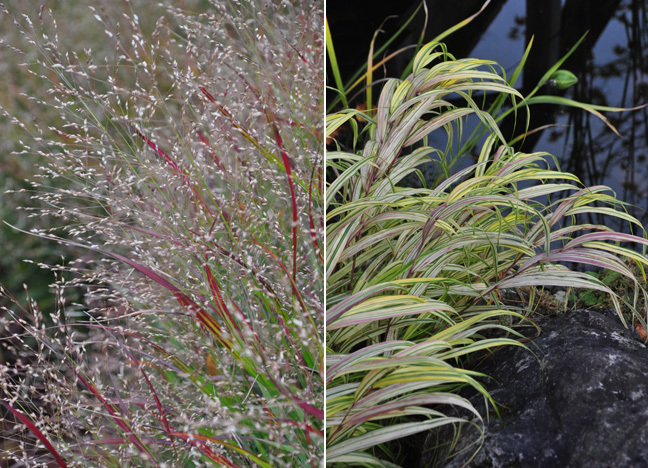 Switchgrass, Panicum virgatum on the left and Japanese Forest Grass, Hakonechloa on the right. 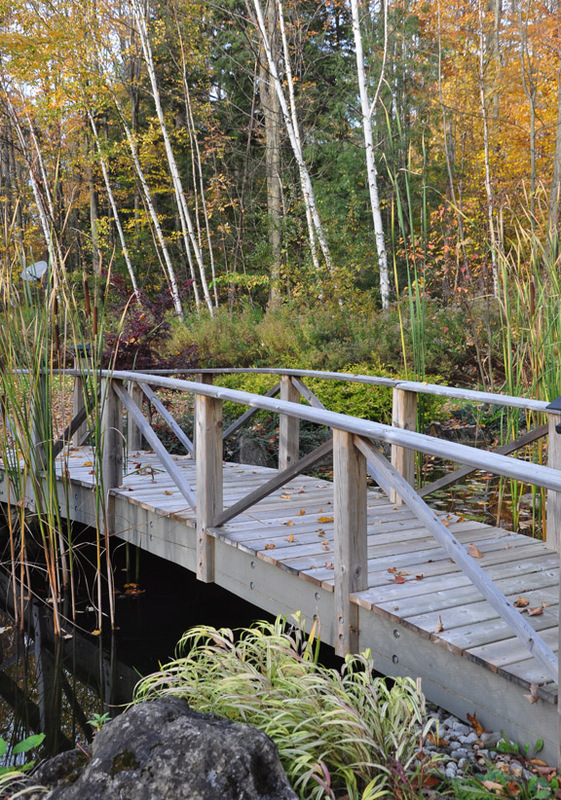 The plantings around the pond include shrubs, perennials and grasses. There are tall clumps of Switchgrass, Panicum virgatum, and on the water's edge, there is low-growing Japanese Forest Grass, Hakonechloa. In the shady area next to the waterfall, there are several types of hosta, ferns and Astilbe with its striking red plumes. Astilbe as photographed during my first visit in August. 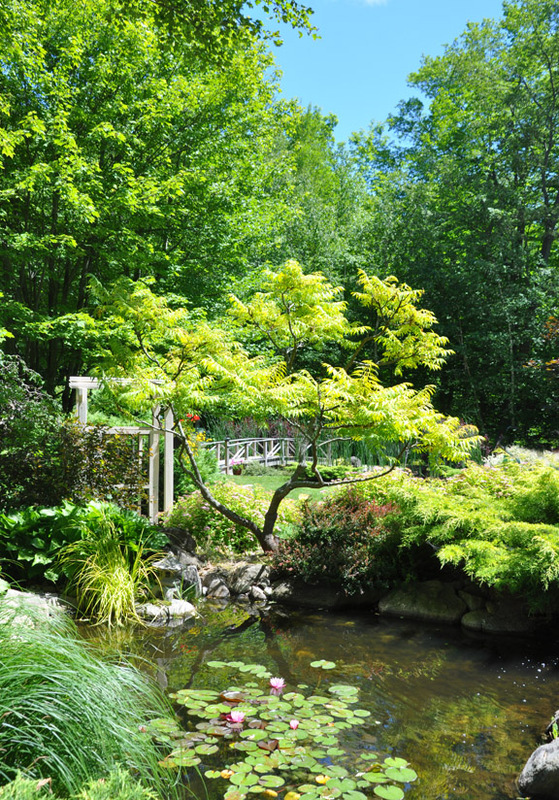 A Japanese Maple growing next to the pond. A view of the bridge from the back of the property. Hosta in their golden fall hues. Both the large pond and a second, smaller pond (that you will see shortly) freeze over in the winter. The fish move to the comfort of warm water at the bottom of the pond. A bubbler (seen above) keeps a small surface area open and allows any gasses to escape. Waterlilies add an ornamental element to both ponds, while native Bullrushes give the larger of the two ponds its natural look. Together the water plants provide a place for the koi and goldfish to hide from predators. 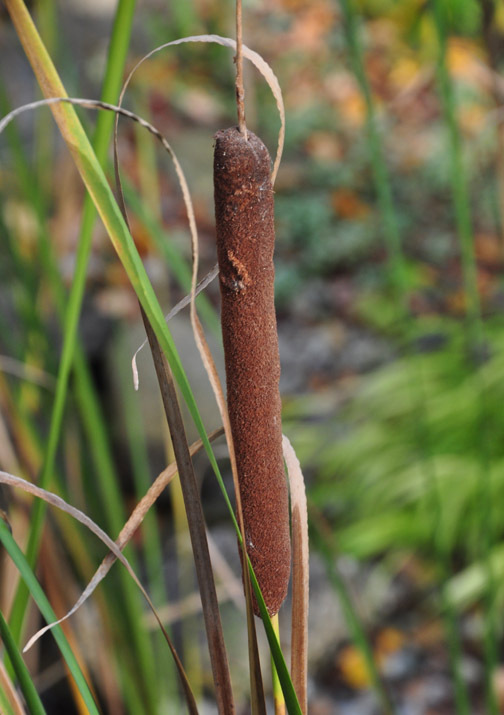 The tall bullrushes waving in the breeze also work to discourage birds looking to do a little fishing. Both water features attract wildlife to the garden. A mink, muskrat and a snapping turtle have all attempted to take up residence in the large pond. Recently the Gooderson's returned from a trip to England to find a heron taking full advantage of their absence. 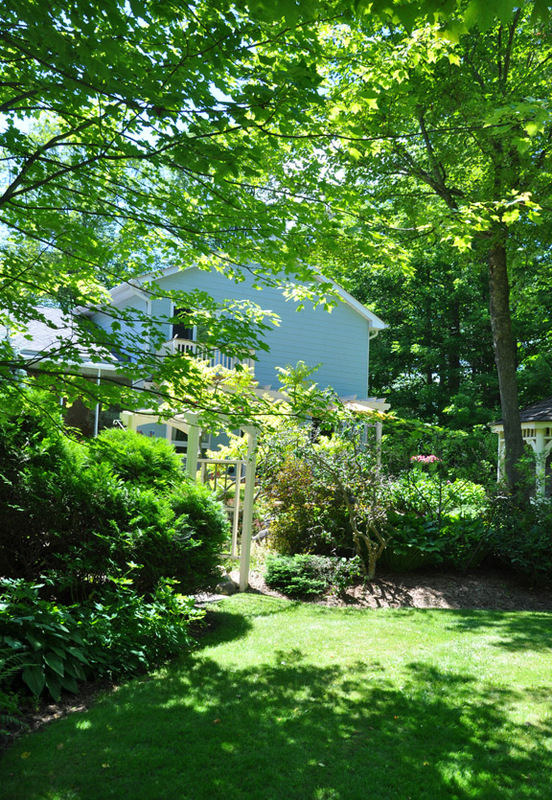 A ribbon-like area of garden begins at the back deck and then turns to run parallel to the back of the house. 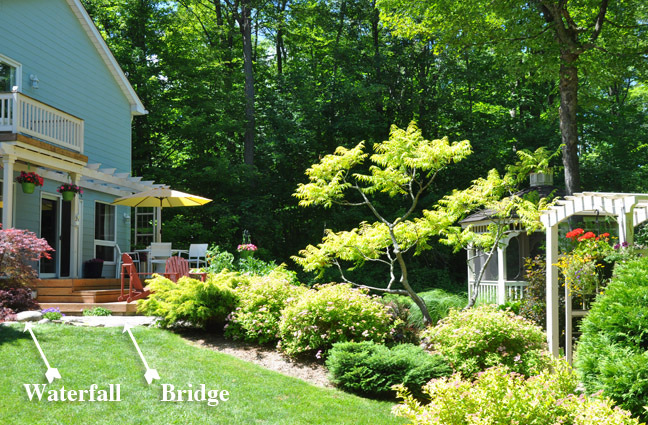 This band of shrubs trees, and perennials breaks the expansive backyard into smaller, more intimate areas. 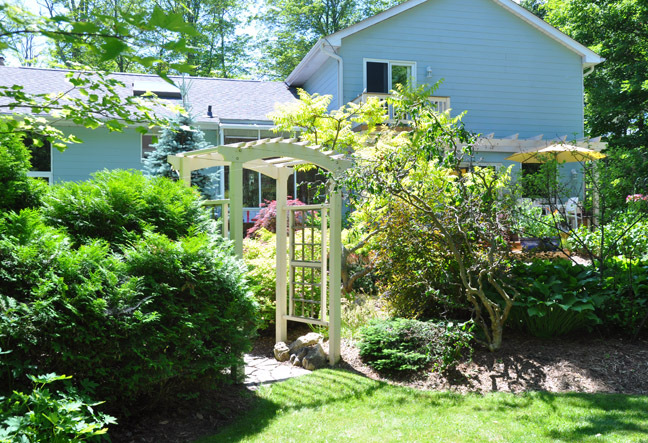 An arbor allows you to pass from one area to the another. 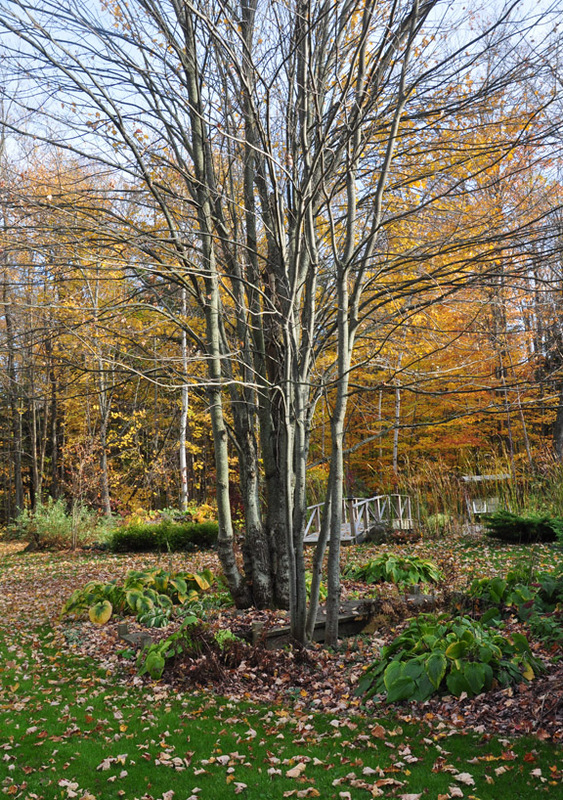 While the garden appears to be fairly low-maintenance, looks can be deceiving. Weed seeds readily blow in making weeding one of the biggest tasks on Sue's list of garden chores. Adjacent to the deck at the back of the house, there is a tiny waterfall that empties into a stream. 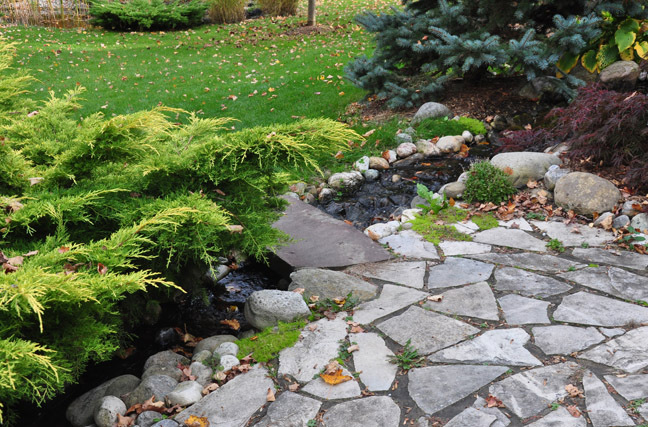 The stream flows over a bed of pebbles down the natural slope of the backyard and empties into a second, smaller pond. A single slab of stone creates a bridge over the flowing water. The waterfall to one side of the back deck. A large slab of stone forms a bridge over the stream. In August pink waterlilies were blooming in the sunshine. 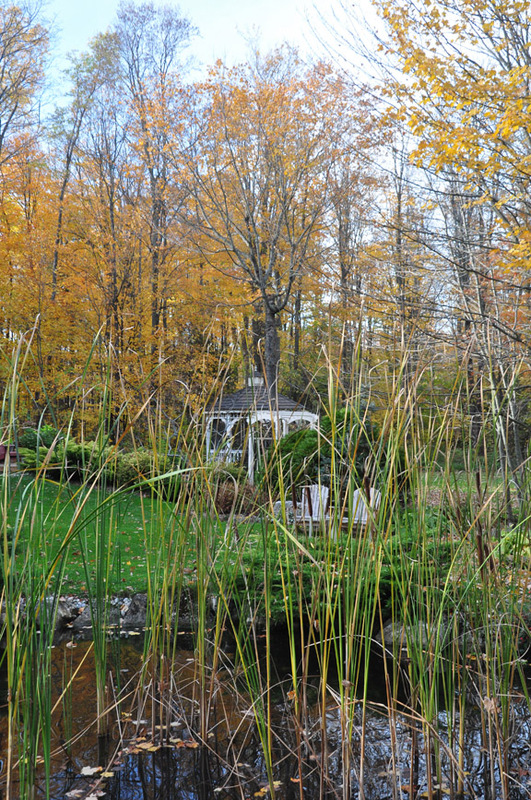 The gnarly branches of a Sumac and a stone lantern give the pond a bit of a Japanese feel. Ornamental grasses, hosta, shrubs and evergreens complete the plantings. 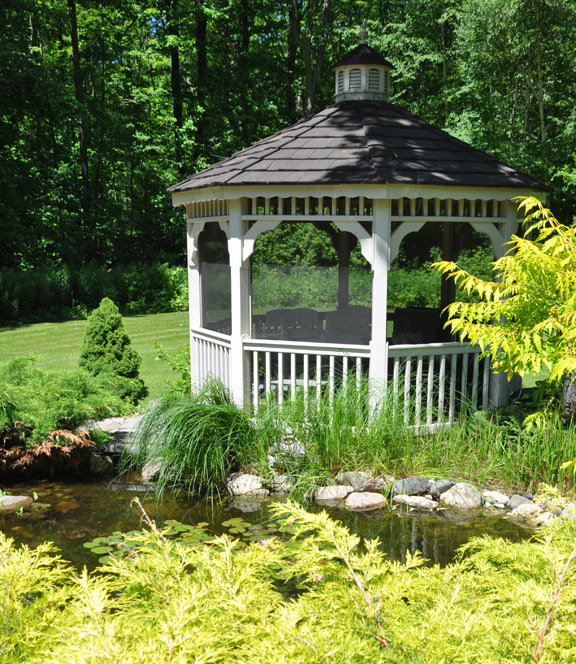 A screened gazebo is the perfect mosquito-free retreat. The small pond in the summer season. Water features like this are wonderful, but how much work do they entail? Frank figures that he spends a couple hours a week on routine maintenance; checking the pumps, dealing with algae and keeping an eye on water levels. The hydrangea planted adjacent to the gazebo. 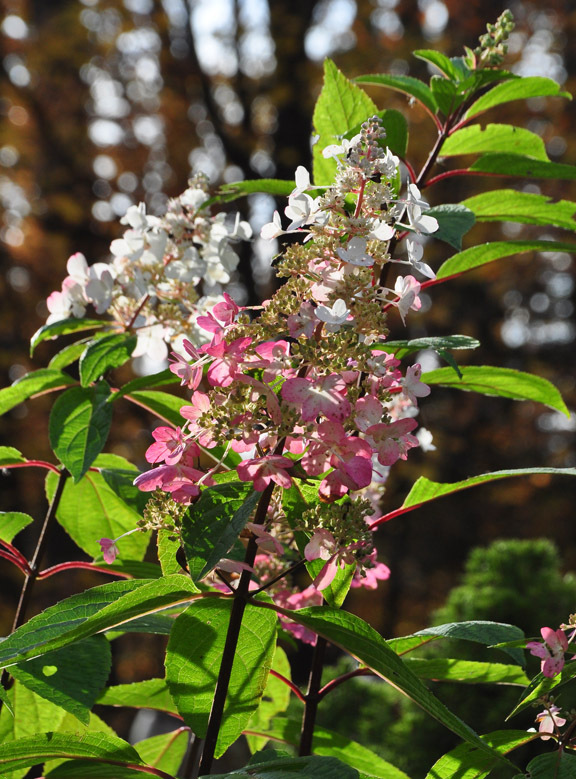 Hydrangea paniculata 'Pinky Winky' has large, two-toned flower panicles that open white and age from the base of the flower to pink. 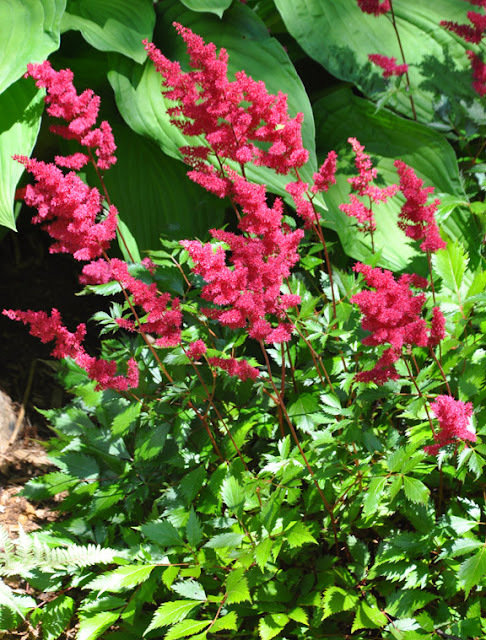 This shrub is adaptable to most soils in both sun and part-shade. 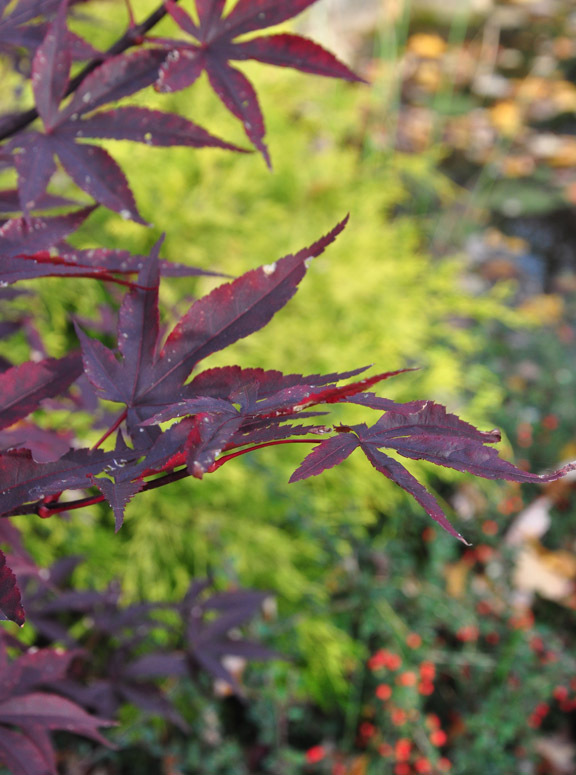 It blooms on new wood, so you can prune it in the late fall or early spring. This hydrangea has the bonus of being a drought tolerant shrub. Height: 1.8- 2.4 meters (6-8 ft), Spread: 1.2-1.5 meters (4-5 ft). USDA zones: 3-9. There is the seasonal maintenance as well. 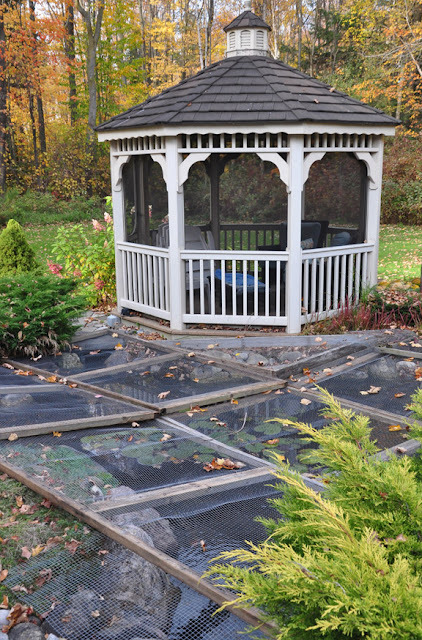 In the fall, screens are placed over the surface of the smaller pond to keep falling leaves out of the water. 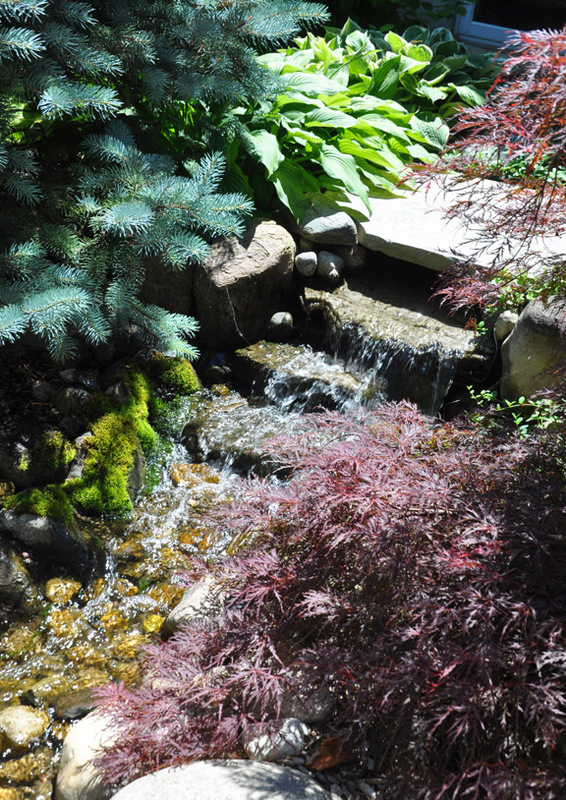 Water features like these help bring a garden to life. They're a haven for insects, frogs and so many other types of wildlife. And the sound of falling or moving water is always so relaxing! Maintaining a water feature might require some work, but I think the Gooderson's would tell you it's well worth the effort. "Plants give me oxygen, and I give them carbon dioxide. We need each other." When it comes to inmates in the prison system, a charitable viewpoint ends for many people. So often there is little sympathy for those who find themselves on the wrong side of the law. 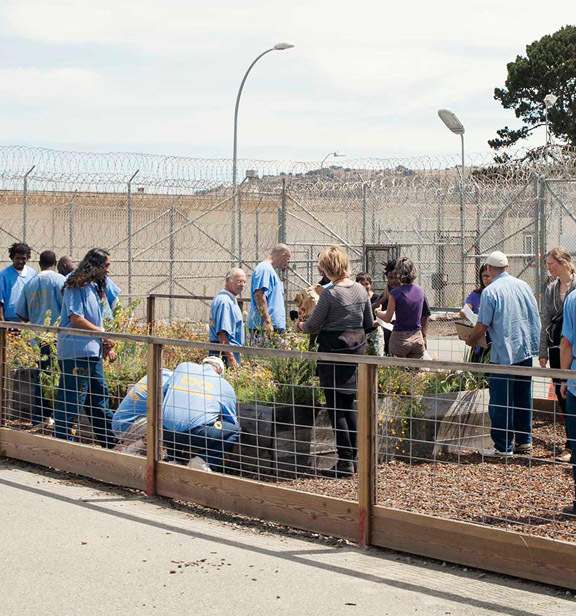 Perhaps it is not surprising that it took Beth Wiatkus a full year to gain permission from San Quentin Prison to create a small flower garden, and an even longer period of five years to add a second, larger garden to the otherwise rather bleak prison grounds. But with perseverance, Beth installed raised beds, assembled a team of volunteers and designed the year-long garden curriculum that was to become the Insight Garden Program. Beth Waitkus and a group of inmates in their garden. The raised vegetable and herb beds. Beth had been working as a communications and organizational consultant when the attacks of 9/11 made her question her faith in humanity. As part of the process of dealing with the tragedy, she had a opportunity to take a tour of the San Quentin Sate Prison. A lifelong gardener, Waitkus was saddened by the desolate and depressing prison yard that was utterly devoid of any greenery. As part of the tour she met the director for the Insight Prison Project, which provides meditation, yoga and restorative justice classes for the inmates. That chance meeting turned out to be pivotable for Beth. In 2002, Beth launched the Insight Garden Project. "Everybody has a heart and a chance for transformation," she says. The idea of the program is to connect inmates with self, nature and the community providing for a healthier life while in prison and after release.The group meets once a week. Guest speakers talk with prisoners about ecosystems, permaculture, green jobs training and healthy food. Many of the men in the medium-security unit have little or no experience with nature or working in a garden. 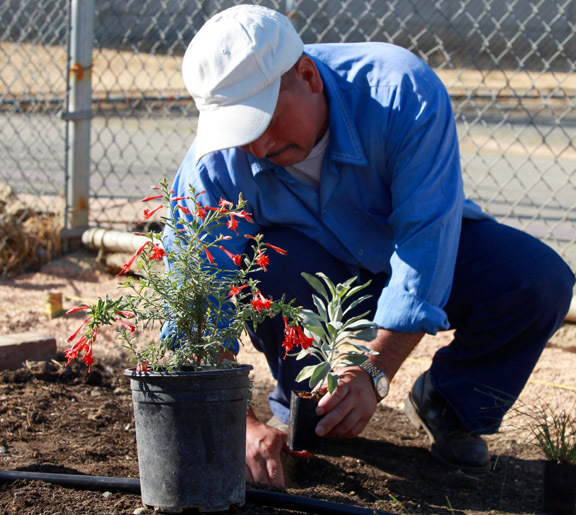 The hope is that prisoners who take responsibility for planting, tending and harvesting the garden will take responsibility for their own lives. 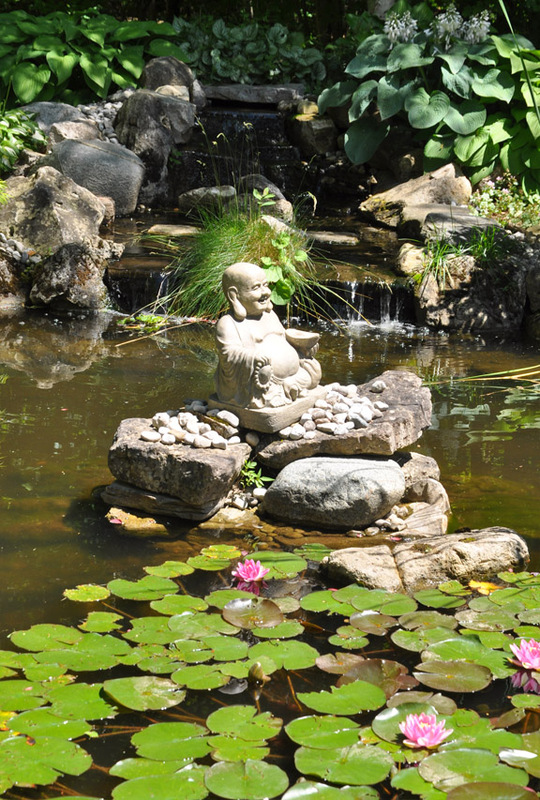 Mindfulness practices encourage the men to see their lives as a garden they tend. Gardening increases confidence, allowing people who may lack skills or education to see success quickly in their work. Seeds sprout and buds soon become food. 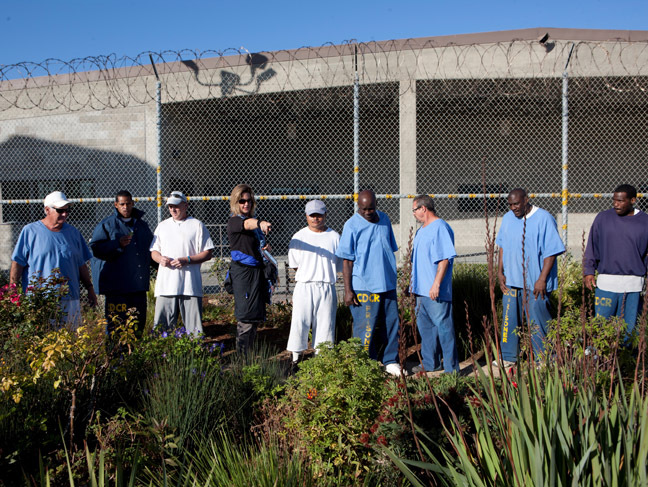 Fifteen years later the garden at San Quentin is a thriving plot of drought-tolerant plants. The vegetables and herbs grown are donated to local non-profits. San Quentin Prison, just north of San Francisco, houses inmates serving sentences under 15 years. There is an alarming statistic that in the U.S. over 50% of inmates return to prison within three years. The less charitable among us would say that bad people will always tend to do bad things. Released from prison without skills, employment and little community support, inmates can default to their previous criminal behaviour. It's a simple case that desperate people sometimes resort to doing desperate things. I think it comes down to your faith in humanity. Perhaps there are some who are unreachable and certainly there are those who ought to remain in prison due to the serious nature of their crimes. On the other hand, it is also possible that a long series of life's misfortunes added up to a person making a serious mistake. Beth Wiatkus believes that everyone deserves a second chance. She's grown to realize that people who have made poor choices still have the capacity for change. Sometimes that change involves a man getting his hands in the soil and caring for plants to learn empathy, perseverance and discipline. Beth's faith has been well rewarded. 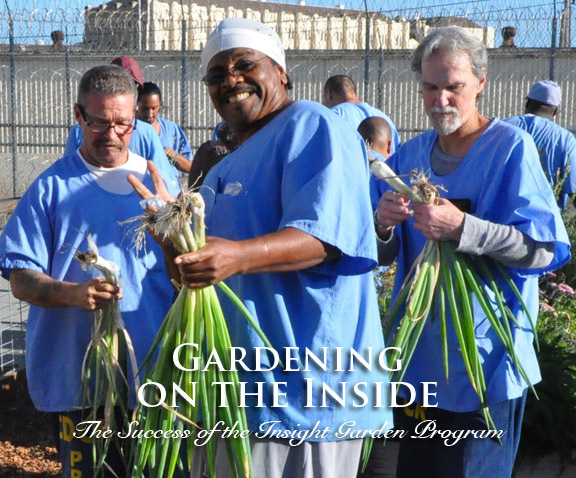 A survey in 2011 showed that of the 117 garden program participants who were paroled between 2003 and 2009, less than 10% returned to prison or jail. With the growth of conservative ideology, projects like the Garden Insight Program are always in jeopardy. The sad thing is, this is a program that has proven itself to work. Fortunately, the Garden Insight Program was granted a non-profit status in 2014 and had the good fortune to receive a generous gift of $200,000 a year from an anonymous benefactor. Additional funding from the California Department of Corrections and Rehabilitation has lead to the expansion of the program to two additional state prisons. Waitkus and her team are also launching programs in Indiana and New York state. It's heartwarming to think that gardening can help people turn their lives around. 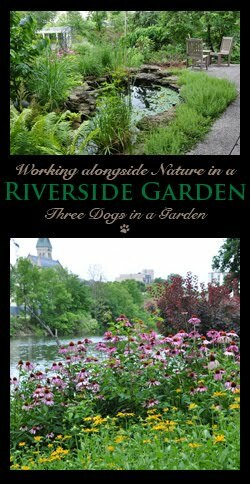 Thanks to the Insight Garden Program for permission to use the images in this post. Learn about the Evergreen project to complete a community based naturalization and garden project as a transition program for federally incarcerated women in British Columbia, Canada. 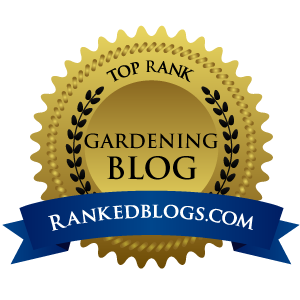 As I have become a more experienced and sophisticated outdoor gardener, I have felt that there has been a shift in my attitude toward indoor plants. While there are still a few common houseplants I'll always love, I am more decerning than I used to be. If I am going to bother with keeping indoor plants, I want them to be as interesting as my outdoor plants. Container planting photographed on May 30th just after being potted up. 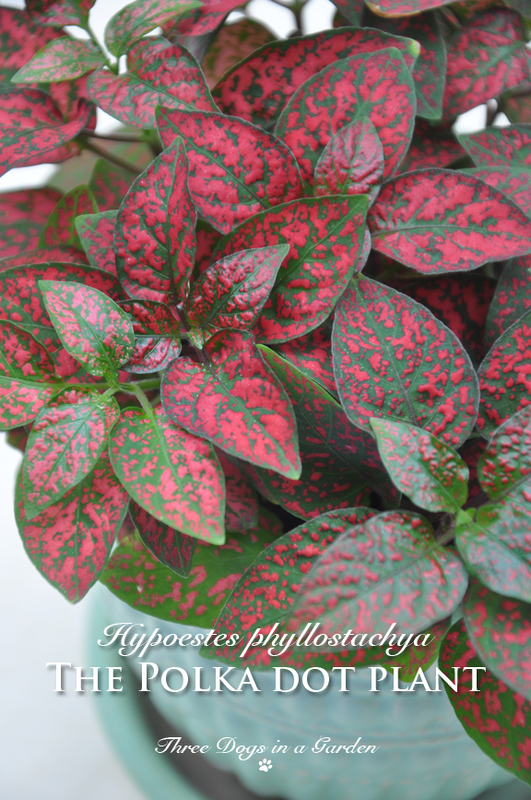 I first got to know Hypoestes Phyllostachya when I picked up a plant to use in one of my outdoor container plantings. With its pink polka dots, it struck me as a nice alternative to standard annuals. Despite the fact that I crammed a fair bit into a modest-sized pot, all the plants performed pretty well. The only exception would be the white pansy which surrendered to the effects of the hot summer sun. The other plants took full advantage of the absence and filled in to take the pansy's place. As you can see the pink darkened into magenta and green became more olive over the course of the summer. When the plants in my pot got a little leggy mid-summer, I took cuttings and made even more plants. 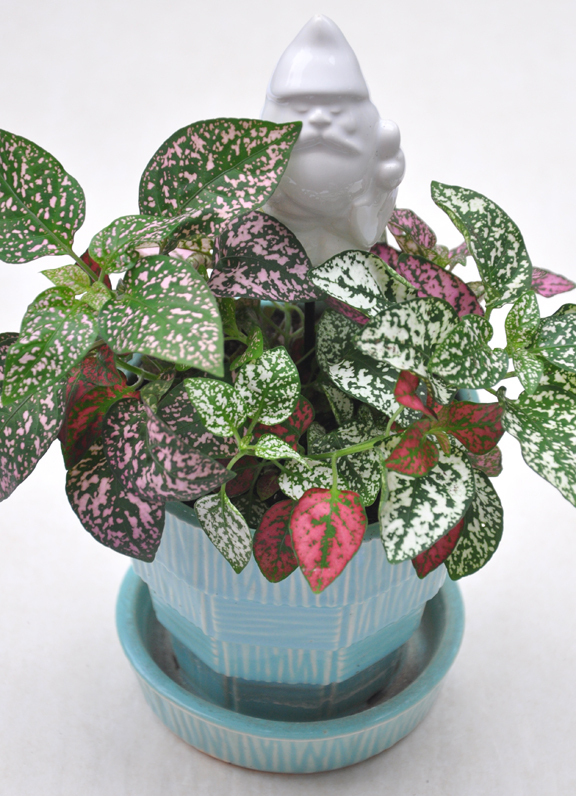 Originally from Madagascar, Polka Dot Plants are a herbaceous perennial in their native habitat. Outdoors they that can grow up to two or three feet. Here in North America, they are generally kept as houseplants. 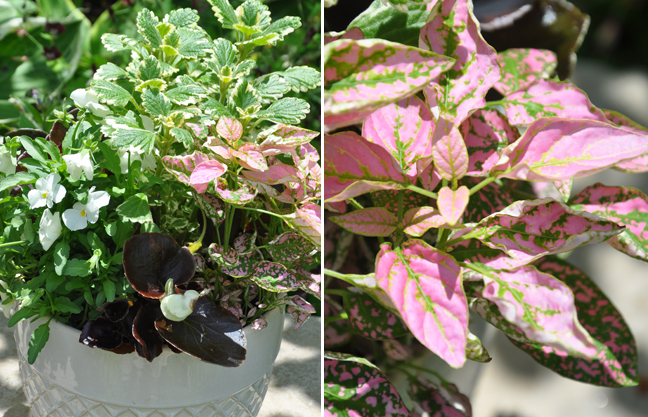 The main reason to grow these plants is their cheerful speckled foliage. The 'Splash' series is dotted splotches of pink, white, rose and red. The 'Confetti' series has the same color palette, but the spots are a bit more sparse. Light: Bright, indirect light is their preference. Too little light may result in leggy growth. 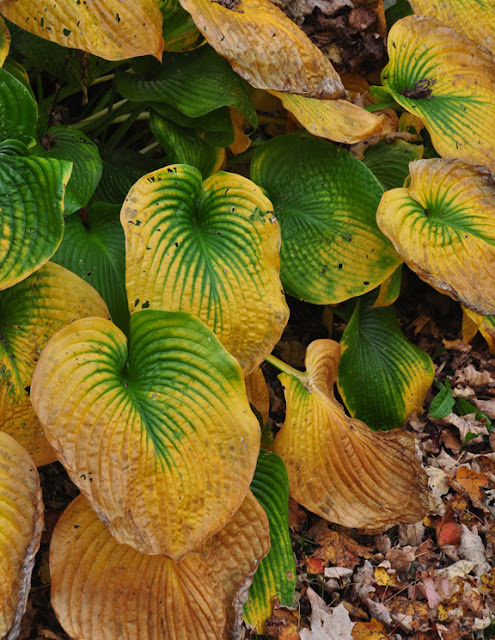 Low light can also cause colorful spots to fade and the leaves to turn solid green. Water: Moist, but not soggy soil is best during the growing season (indoor plants have a spring and summer growing season just like outdoor plants). 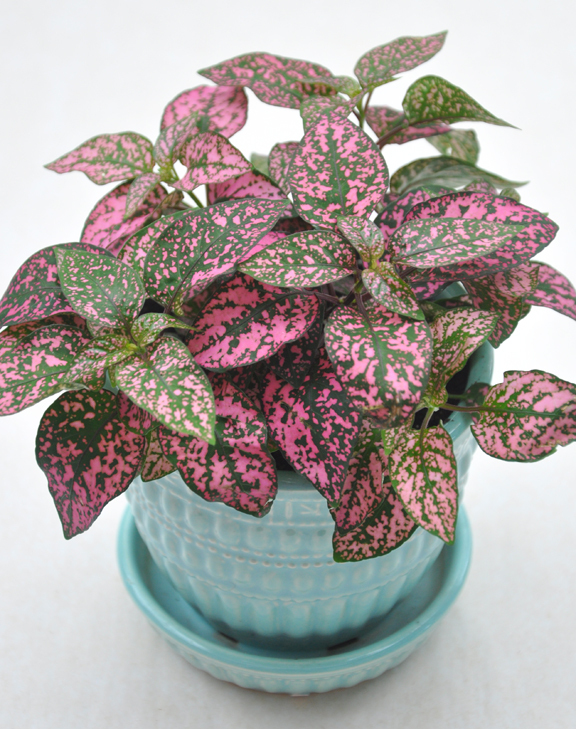 In the winter, Polka Dot plants like to be just a bit drier. If your plant produces a flower and moves into a dormant phase, reduce your regular watering regime until the plant shows new signs of growth. 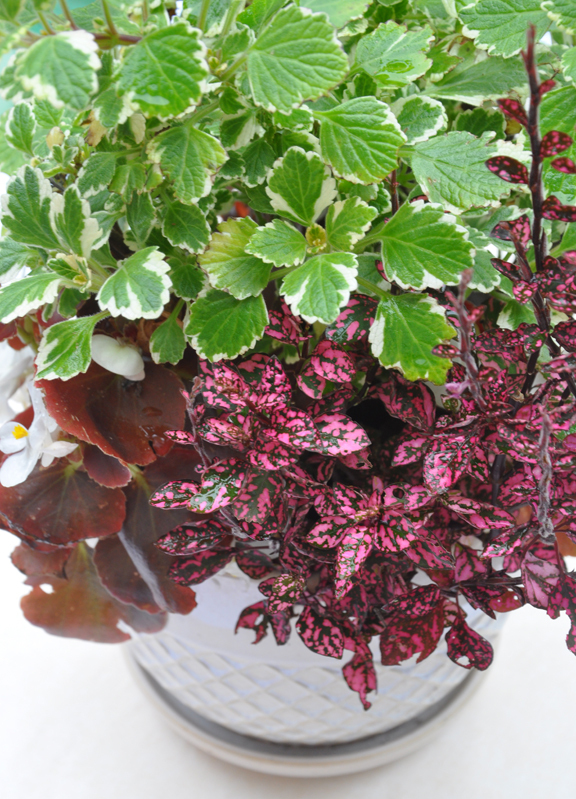 Soil: For indoor plants use a good, well-drained potting mix. 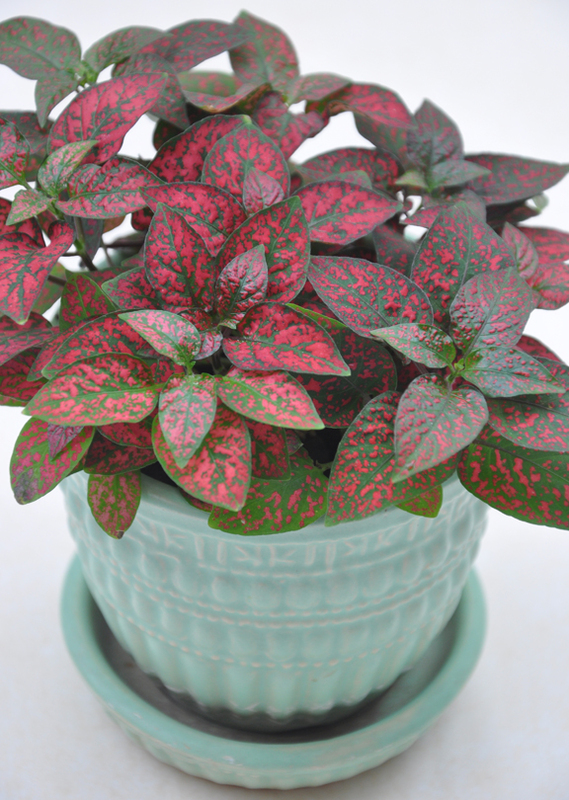 When planted outdoors as annuals, Polka Dot Plants require well-drained soil rich in organic matter. Fertilizer: During the spring and summer feed your plant weekly with a liquid fertilizer following the package directions. Care: Pinching back growth will encourage a bushier plant. 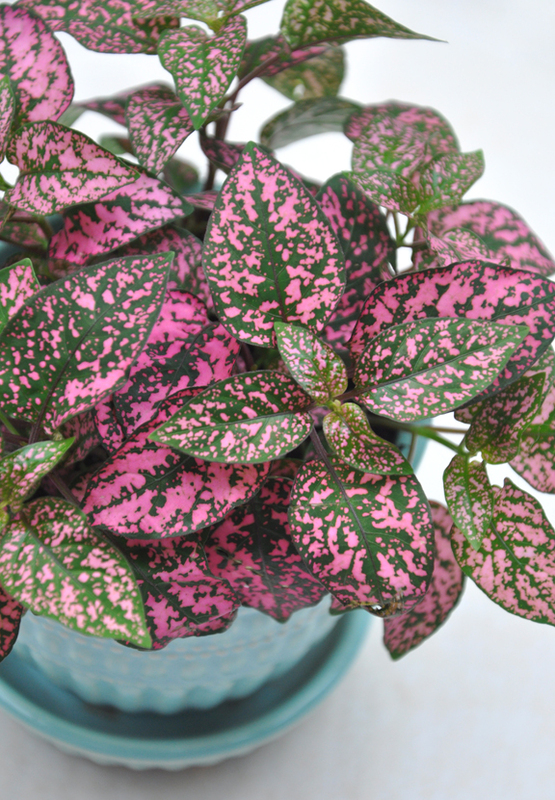 Propagation: Polka Dot plants aren't particularly long-lived. Once they have flowered they will move into a dormant phase or may die altogether. Growing new plants from cuttings is fairly easy. I tried rooting my cuttings in water, but that didn't work. Placing the cuttings right into the soil worked perfectly. Just remember to keep the soil moist and the cuttings out of the direct sun until they root and you should have no problem making new plants. Pests: White fly, scale and aphids can be potential issues. 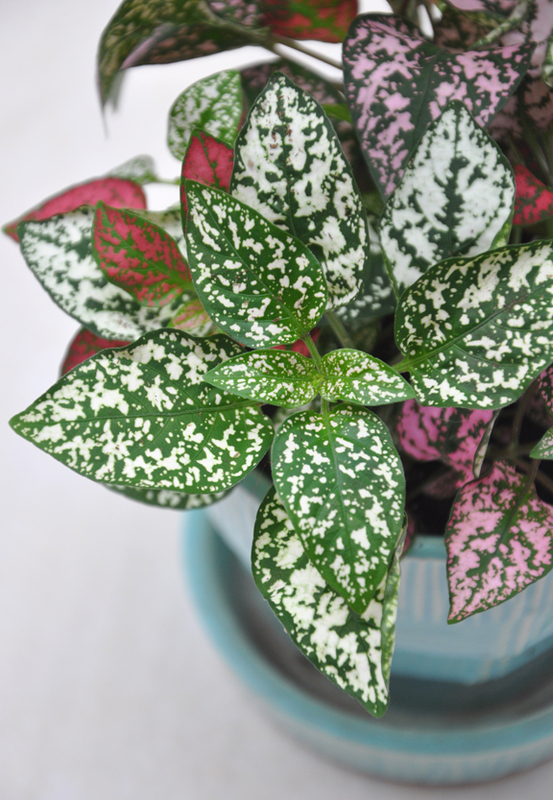 Polka Dot Plant's bright splashes of color are just as pretty as flowers and it's always nice to have "flowers" inside the house when outside the garden is sleeping under the snow. With the exception of the roses, the odd phlox and some sedum, just about everything has finished flowering in my garden. A few of my Eupatorium, however, are just coming into their own. 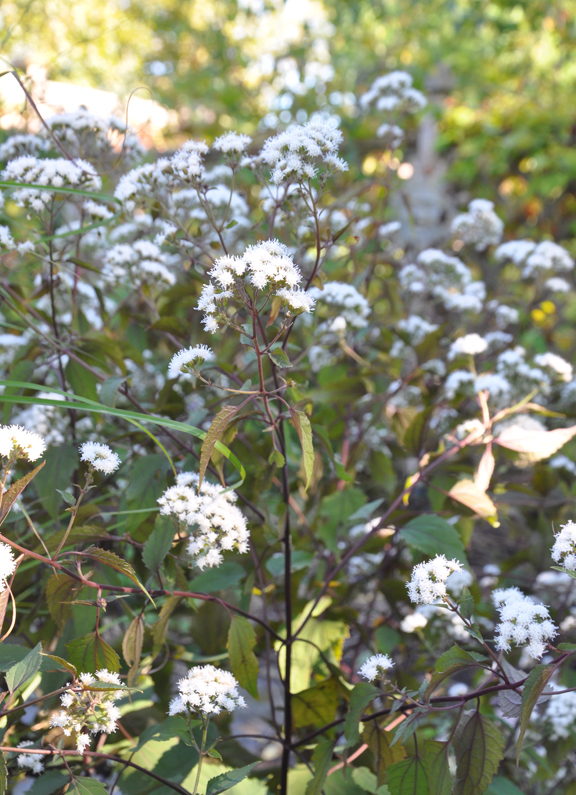 Here we are in early October and the smallest of the three (Eupatorium rugosum 'Chocolate') has only recently begun to flower. 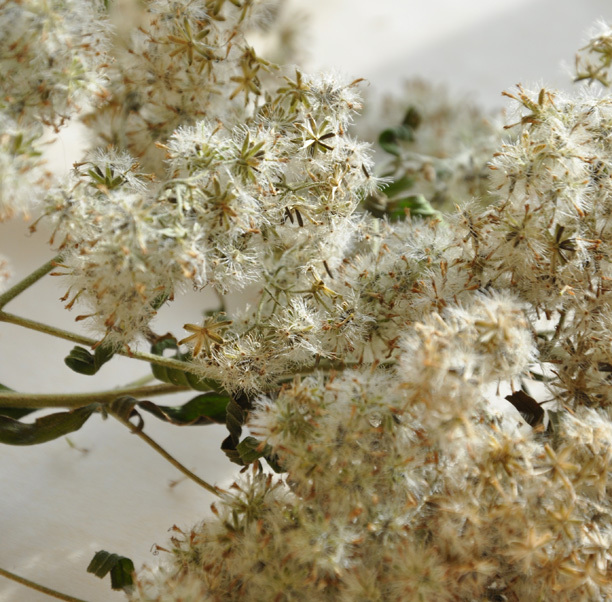 Eupatorium is members of the large Asteraceae family. This large genus of plants contains as many as 60 species depending on the classification system used. 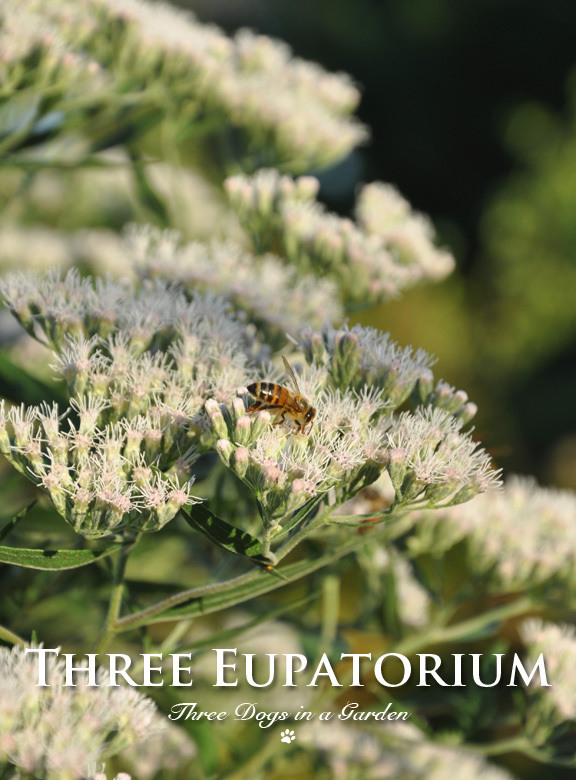 I grow a number of different Eupatorium, but in this post, I am going to focus in on three of my favourites. To be honest, I don't think this plant has particularly attractive flowers, but there is something about the way the flowers catch the light that transforms them into something quite lovely. 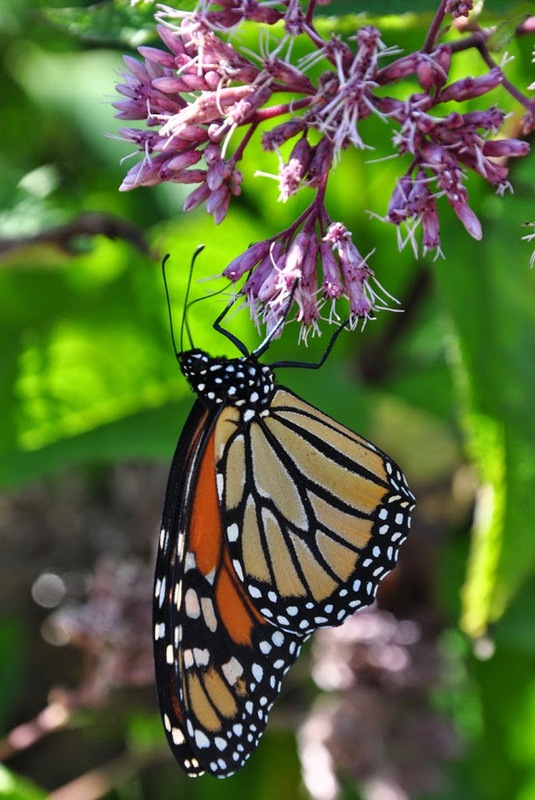 Bees and butterflies seem to appreciate them too. 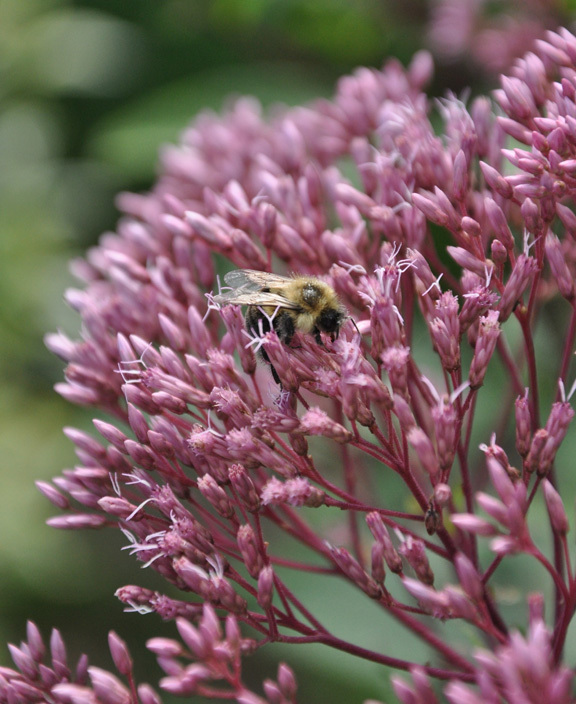 The species Eupatorium dubium is native to Eastern North America. The hybrid, 'Baby Joe', is more compact than the original native plant. One of the many reasons I like 'Baby Joe' is its strong, upright, deep red stems. Overall the shape of the plant is tall and vase-like. In full sun, 'Baby Joe' would require moist soil. My plant is in part-shade. Generally its happy with average moisture conditions. If we haven't had rain for a week or so in mid-summer, and the leaves are beginning to look a bit droopy, I will often water 'Baby Joe'. Last year we had a summer-long drought and it was one unhappy plant. 'Baby Joe' prefers soil with lots of organic matter, but it is pretty adaptive to average, sandy or quite gravely soils. The moment the flowers show signs of going to seed, I cut them off. Plants grown from these seeds may revert to the native species rather than the hybrid form. Height: 70-75 cm (27-29 inches), Spread: 75-90 cm (29-35 inches). USDA zones: 4-9. 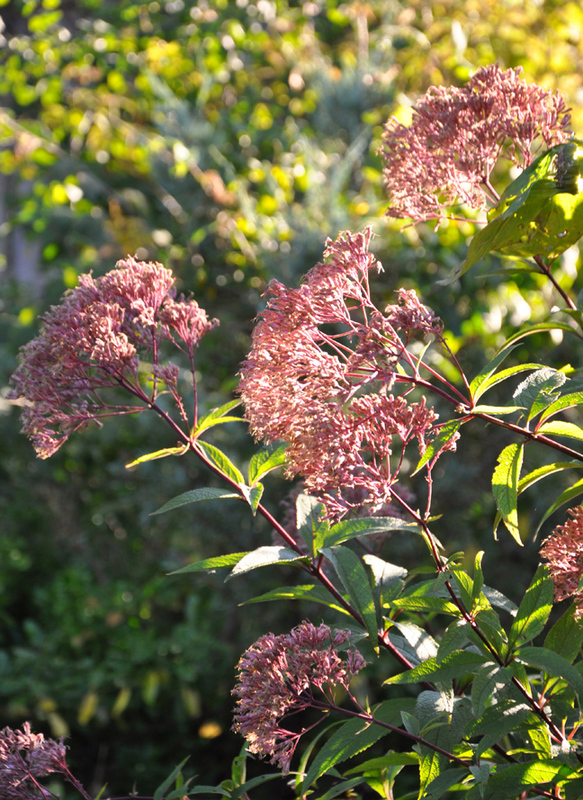 Eupatorium altissimum is one of my favourite fall plants. It sprawls a bit wildly and leans on other plants, but I look forward to that cloud of white flowers every autumn. Tall Boneset, Eupatorium altissimum is native to eastern and central North America where it can be found along stream banks and in damp meadows. This tall perennial has lance-shaped green leaves and clusters of white flowers in late summer/early fall. In full sun, it needs consistent moisture. 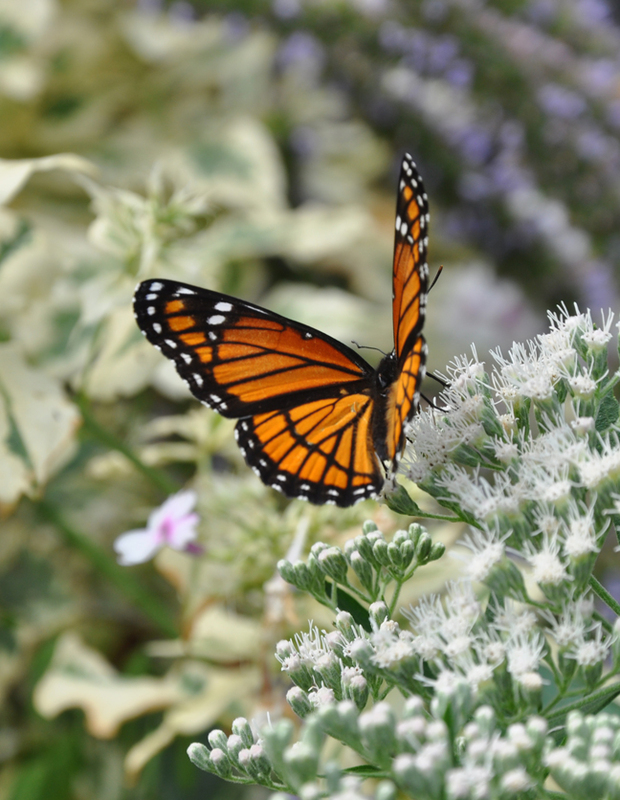 I have one plant (actually Eupatorium altissimum 'Prairie Jewel') in sun and somewhat dry conditions. It can look wilted if a week passes without rain. I really must move it if I can (reputedly they don't like to be moved). In light shade (some rest from the afternoon sun), Eupatorium altissimum will tolerate average moisture conditions much better. It is not super fussy about soil and will do fine in both clay and sandy soils. 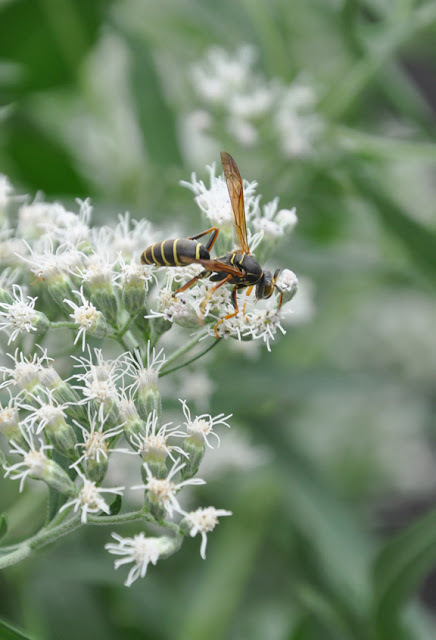 One reason to grow this plant is the insects it attracts. 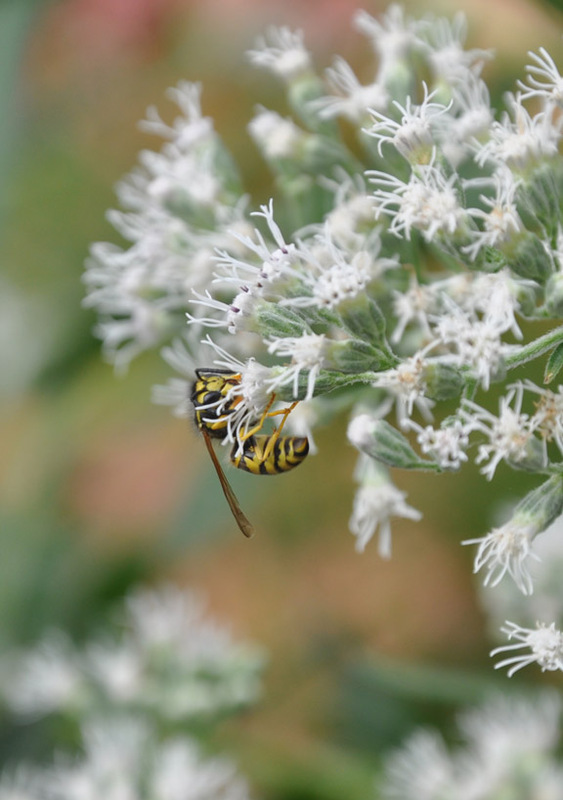 Bees, wasps and butterflies all love this plant. Again it is important to note that this plant is a liberal self-seeder. If you don't deadhead the flowers, you may have a weedy problem on your hands! Height: 1.2- 1.8 m (4-6 feet), Spread: 1-1.2 m (3-4 feet). USDA zones: 3-8. 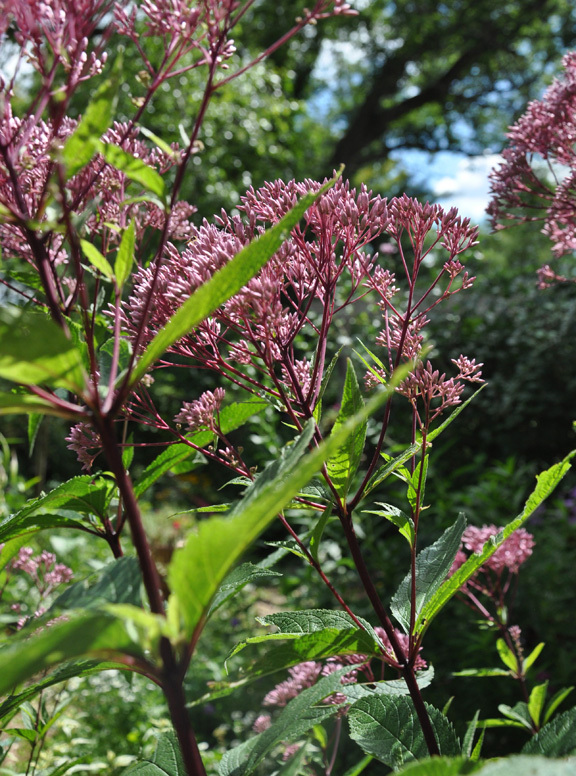 There's a long wait for Eupatorium rugosum 'Chocolate' to bloom, but the plant itself is so attractive you won't mind. Eupatorium rugosum 'Chocolate' has attractive maroon-brown foliage in spring. 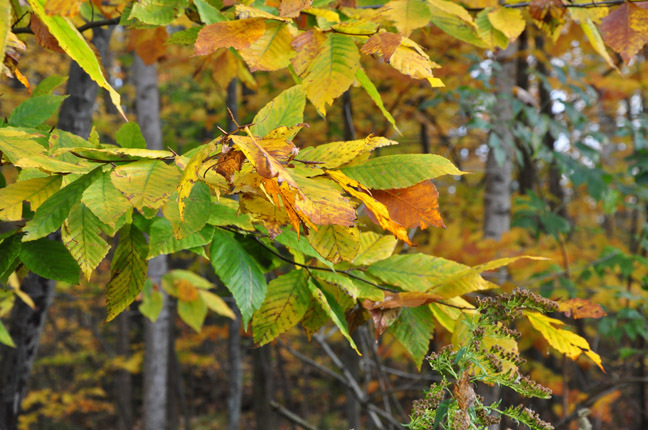 The tops of the leaves turn olive-green as the summer progresses, but the plant's stems and the undersides of the leaves remain a nice contrasting shade of chocolate. In full sun, 'Chocolate' will need moist soil. In part-shade, it will tolerate somewhat drier conditions (once established). 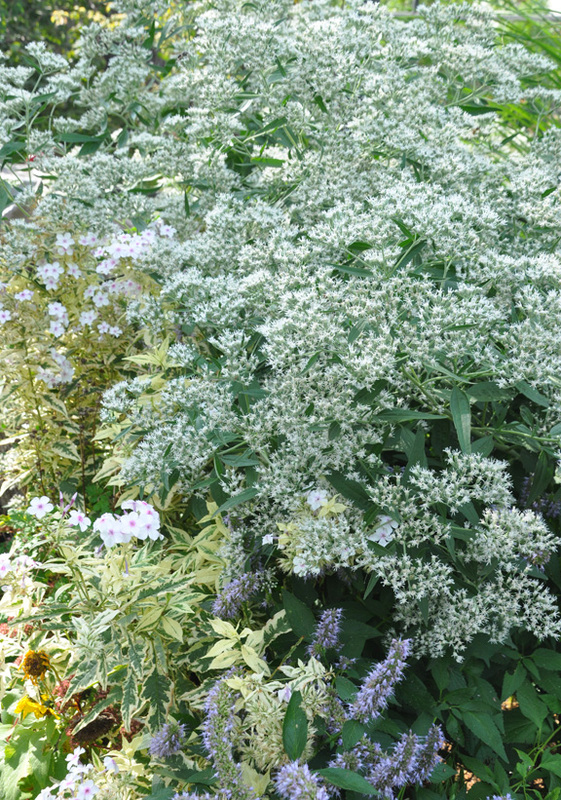 'Chocolate' has flat clusters of starry white flowers in late summer/fall. 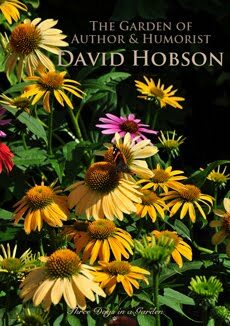 It is important to deadhead the flowers to avoid self-seeding. 'Chocolate' will not come true from seed. Height: 90-120 cm (35-47 inches), Spread: 75-90 cm (29-35 inches). USDA zones: 5-9. 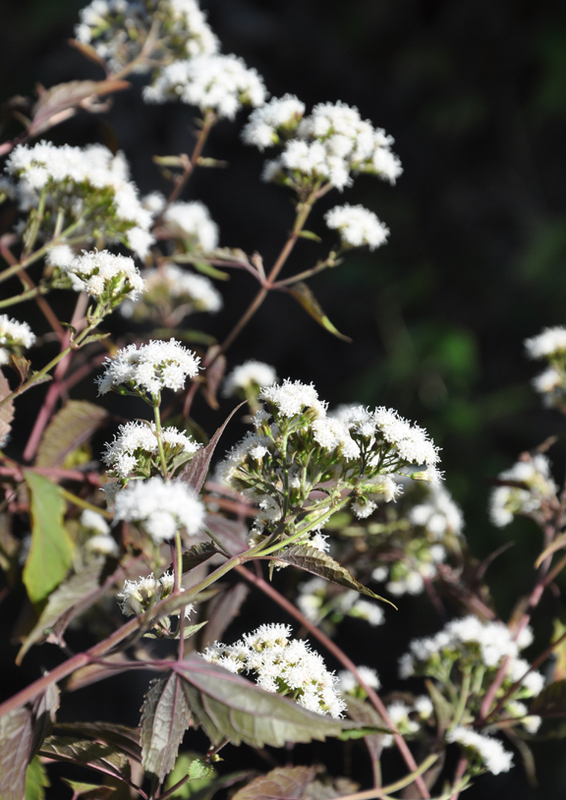 Of the three Eupatorium featured in this post, Eupatorium rugosum 'Chocolate' is the shorter, smaller, bushier plant. 'Baby Joe' is tall and fairly narrow. It would still be fine in a small garden. Both tall and bushy, Eupatorium altissimum requires the most space. Eupatorium rugosum 'Chocolate' will tolerate the most shade. In an ideal world, all three plants prefer moist conditions. 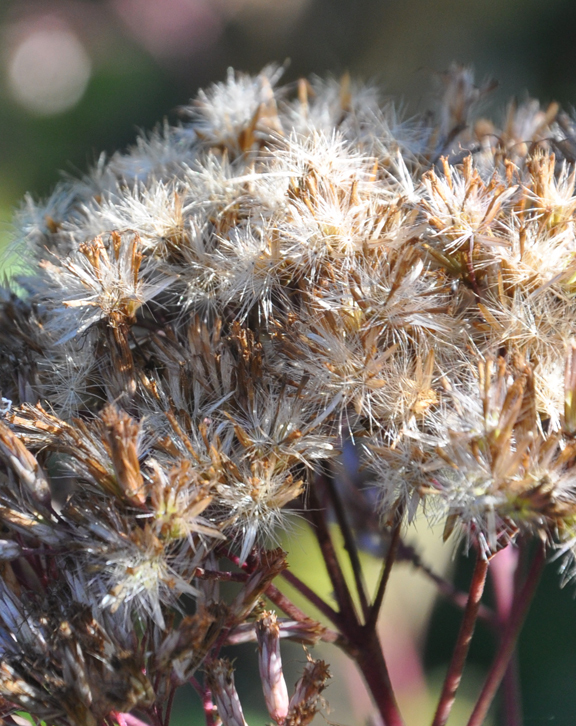 Eupatorium altissimum will survive some dry weather. Just don't ask it to be happy about it. Eupatorium rugosum 'Chocolate' is reputed to be the most tolerant of drier soil (once established). 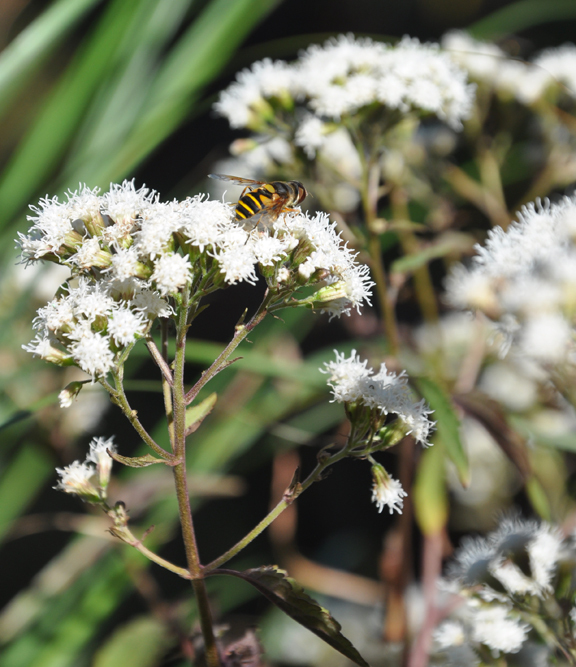 Eupatorium altissimum positively hums with insects! 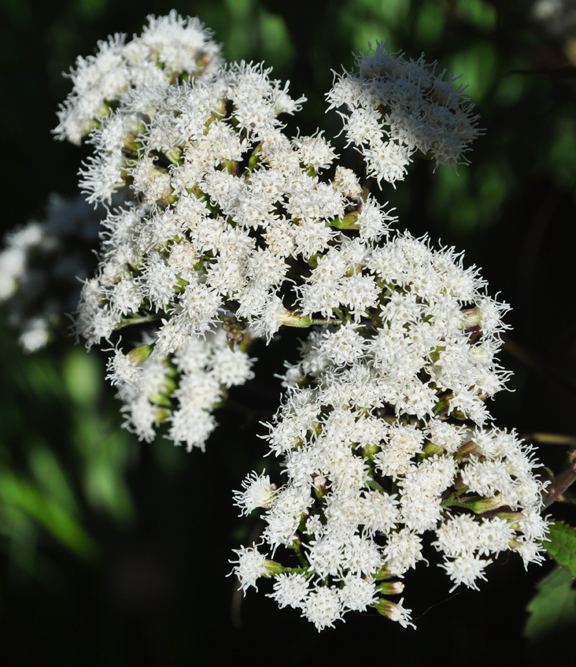 Eupatorium rugosum 'Chocolate' seems to be the least popular of the three plants (based on my observations).